Oh, the sheer number of disciplines in which small scale farmers must be proficient. They are chemists and biologists, with a firm understanding of soils, nutrients, diseases, life cycles and more. They must have a good understanding of markets, bookkeeping and business practices, export and distribution, marketing, weather and climates, water usage and regulation, food science, marketers, and, not the least, packaging engineers. Protect food from chemical, biological and physical damage (such as spoilage, salmonella and cracked shells). Provide consumers with ingredient and nutritional information. Allow for traceability, convenience and tamper indications. In 1903 Martin L. Keyes patented the first machine for molding fiber pulp. The Keyes Fibre Company is alive and well today. They are best known for creating the Chinet brand of paper plates. In Keyes' original design, a two part mold was dipped into a fiber pulp slurry. Suction caused a layer to stick to the first half while the second half pressed the object into shape. The overall process has not changed much today; the second half of the mold is now unnecessary and a wire mesh covers the mold to better distribute the pulp slurry. Look closely at your egg cartons and you can see the pattern of the wires. There are four categories of pulp product on the market today. They are divided according to the quality of the raw materials and the number of refining steps. 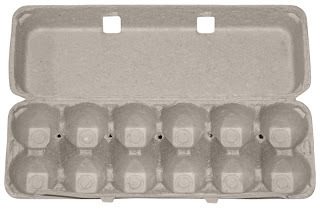 Egg cartons are generally a mid-grade known as 'transfer molding'. It's thinner and both sides are finished to a neat smoothness. The egg carton was first developed in 1911. The first egg carton patents combined a cardboard lid with the molded pulp bottom, but the familiar shape that we know today was in existence before WWII. 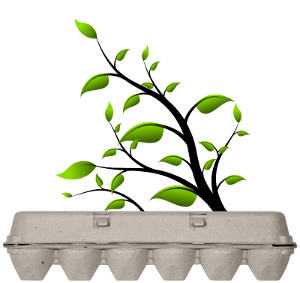 Although molded pulp was a hit for egg cartons from the start, it didn't take off for other types of packaging until the rise of environmental consciousness and sustainability concerns (roundabout the 1980s). Today it is quite a popular packaging option. Companies have experimented with new ideas such as adding bamboo fibers for strength, or--my favorite--seeds implanted in the pulp so that the package may be planted once the consumer is done using it. Did you know that the EPA considers composting to be a form of recycling? Well, it is, of course, but isn't it funny that my first impression is that recycling must be done by people in big plants? 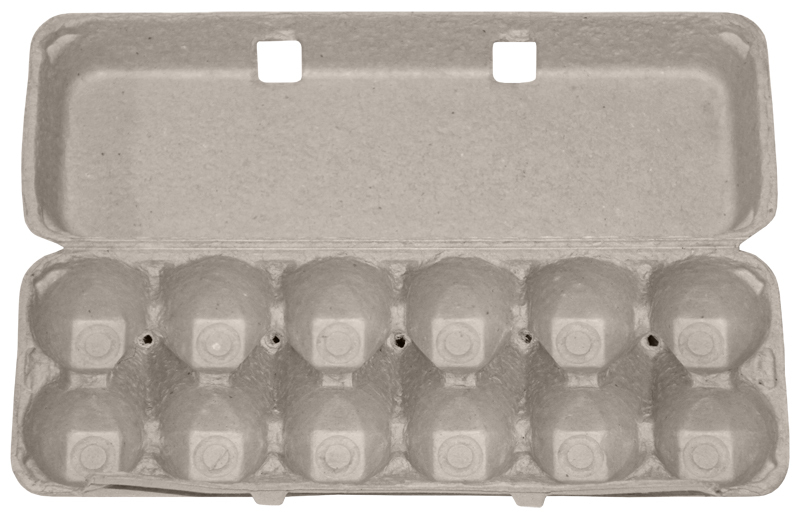 Regardless, fiber egg cartons are easily recycled in either a manufacturing plant or a compost bin. Reducing and reusing are the other two legs of the environmentally conscious pyramid. Reducing packaging by selling in bulk quantities--by using one 30-egg tray instead of five half-dozen-egg cartons, for instance--is an excellent option with many benefits. However, those benefits are lost if the eggs aren't eaten in time and end up going into the trash themselves. Increased packaging might well be worth it to reduce food waste. Reusing pulp egg cartons is often frowned upon because they cannot be sterilized between uses, leaving open the possibility that harmful bacteria could be passed around and making it difficult to trace the origins of outbreaks. Finally, though, we come to the best note of all. It makes me very happy to know this fact, just for its sheer randomness: an egg carton is a monocoque structure. Thanks for the info! I make little things for dollhouses and I like to avoid anachronisms, so knowing when a particular type of packaging was in use is a big help to me.